When I first picked this novel up it was all about the cover. I was at LAX and the bright blue and red color blocking just called to me. And the back jacket did it’s job of intriguing me with story. A few weeks later I picked up the book to actually read it and not just be a pretty face on my book shelf. So after some frantic page turning and late nights here is my review of M.D. Waters’ Archetype. Emma has lost her memory in some kind of freak accident. All she knows is that she wants to please her husband, Declan, and that she has an inner voice that tells her everything is not what it seems. Guided by that pesky inner voice–who seems separate from herself–Emma begins to remember fragments of an extremely different life with an extremely different man, the angry and enigmatic Noah. Set in a future where fertile women are a commodity, Emma must figure out which future she wants to live out–her present as an adoring wife or her past as a member of the rebellion. That is an abbreviated summary to say the least, but I’m trying not to spoil everything in this review. Part of the fun of reading this novel is figuring out the details with Emma. I’ll get into some major spoilers down below, but I also wanted there to be enough info for you if you were trying to avoid the spoilers. The book’s back cover quote references Archetype as a kind of heir to The Handmaid’s Tale, and while I can see the parallels I don’t necessarily agree. They’re in the same genre, certainly. But Archetype is more Alias-esque than Ofred-esque. Which is still a great middle ground for the novel to occupy. If you’re a fan of TV shows such as “Alias” or “Orphan Black” then I would definitely recommend Archetype. The pace of the novel is light and quick without lacking in substance. Episodic style chapters make the read easy but it’s also great for finding a stopping place if you want to draw out the reading experience. This would be such a great book for traveling. It’s not too long and you can devour it on the plane or at the beach. If you’re looking for deep philosophical meaning in your sci-fi, this is not the book for you. Waters doesn’t explain the science and implications on humanity enough for that kind of reader to be satisfied. But if you’re looking for an enjoyable weekend read, give this book a shot. My favorite thing about this novel is that we have a female character who falls in love and then leaves the guy(s) in the end for HER well being and happiness. For that reason alone I would recommend Archetype.It’s just something you don’t see that often in NA. Not that Emma doesn’t love Noah (or Declan). There is definitely a love story there, but Emma leaves because she realizes how unhealthy staying is. That said, I would be shocked if the second book, Prototype, wasn’t about Emma struggling to get back to Noah and prove to him that she’s still the same woman he married in spite of being a clone. And I’d still like to read that story. But I am thrilled that Waters did not wrap her novel up in a prepackaged bow. I’m not going to do Emma Wade the disservice of labeling her a strong female character because that phrase gets thrown around far too much for it to have meaning. Emma has moments of weakness and willfully lives in denial for a large chunk of the book, but these flaws take the story to some really interesting places. Her denial also makes Emma more realistic as a character. I liked this book but my personal rating system has been revolving around whether or not I would physically keep the book. Storage in my life right now is at such a premium. The potential to re-read is also a strong factor. So I enjoyed Archetype and would love to read its sequel, but I think this one may get passed on to a friend or the local used bookstore. The only thing that might sway me is the cover. I might keep this book for the cover because I love the graphics so much. 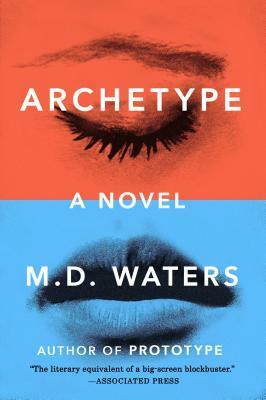 Anyone else read Archetype? Tell me what you think in the comments!